Baby Rhino Heidi at Baby Rhino Rescue | Adopt and Donate Now! Heidi is a rhino who knows the value of adapting! She arrived at the sanctuary and very quickly settled down. 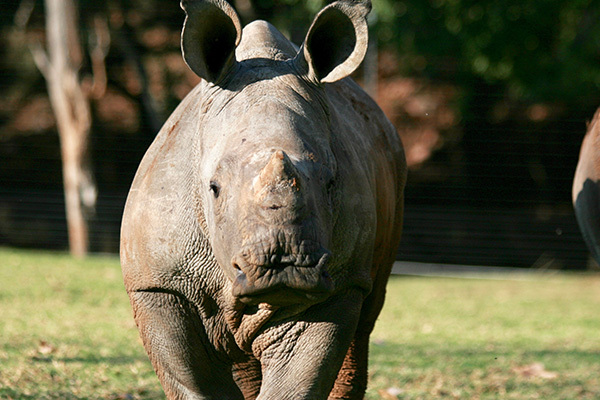 Heidi was only 3 months old when her mother was poached. She was darted by local vets, after a long chase by helicopter. Needless to say, this is very traumatic for a baby rhino: first having your mother killed in front of you, then being chased by a helicopter, and finally having a a burning dart in your rump. Imagine the added stress of waking up in a strange, new environment. Everything about the new place would be terrifying: the odd smells, the sudden confinement, the presence of humans, and worst of all, the absence of your mom. This is a very difficult time for a baby rhino. For this reason Dr Pretorius elects to put baby rhinos who come in under these circumstances on anti-ulcer treatment for up to 6 months. Happily Heidi adapted very fast. She is known by Dr Pretorius as “a sweetheart.” She is just over a year old now. She loves her milk, and knows when it is feeding time. She also knows where feeding will be. If it’s mid afternoon, Heidi heads over to the barn, because her bottle will be waiting.